When children’s carousels are outlawed, only outlaws will have children’s carousels: Confederate flag edition. The above horse was removed yesterday (Friday, July 31, 2015) because, according to the zoo director, several people had “complained” about it. I’m not from the South. I’ve never lived in the South. None of my family has ever lived there until my military-wife sister had to move to Oklahoma and then Texas with her husband. I’ve never owned a Confederate flag nor will I ever do so. I do not care if other people own them, display them, or sit their asses on the backs of wood ponies sporting them. What astounds me is the rapidity with which something can go from being no big deal to being near-criminal in our modern world. Two months ago, there was no issue. Now children’s carousels are being torn apart because of a 5×10-inch historical flag painted over one shoulder. What I am trying to get at is that the emotional reaction people are having is not normal. It is not normal that people went to this zoo and had such an intense emotional response to a children’s amusement ride with a historical flag on it that they had to complain to the director and demand that it be removed. People have been riding that carousel for 20 years without an issue, and all of sudden now people are so overwhelmed with hysterical anger and so offended that they have to destroy (the flag will be painted over) this donated work of art for children. How can people not see that their emotions are being manipulated by the news media which is acting as a mouthpiece for a specific ideology? Perhaps if the pony is repainted to show the ISIS flag or the Nazi flag rather than the Confederate flag, kindly old Mr. Willis’ wooden pony which he worked so hard to create and which he raised the money for will be reinstalled on the zoo carousel. But it is unlikely that people will stop and self-reflect and try to figure out why something that didn’t bother them at all 60 days ago now suddenly sends them into paroxysms of anger and offense. It’s not about Confederate flags, friends. This is only a test run to see how quickly and how intensely the populace can be manipulated into doing the dirty work of liberalism’s overseers. We will see this tactic again, soon, and next time I doubt it will be about something as innocuous as flags. Christians should be preparing themselves mentally, physically, and spiritually for what is coming. This entry was posted in Modernity, Politics, Uncategorized and tagged Confederate flag horse removed from carousel, emotional manipulation by the media, liberalism, Mrs. Thiry, Saginaw Children's zoo carousel, Sunshine, Sunshine Thiry, the Confederate flag ban by Sunshine Thiry. Bookmark the permalink. That’s a cute little horse. There is something going on and I have seen it elsewhere. It’s as if it is open season on the majority demographic, who are not allowed to defend themselves, by any and all minorities, who are protected. This rather hits home for me as I used to be a volunteer/docent at my local zoo. Eventually the SJWs got involved with zoo affairs, and I no longer volunteer there. One of the most ridiculous incidents occurred when the zoo staff planted a garden on the zoo grounds to demonstrate different types of crops raised in our state. This included a small patch of cotton plants. At our annual Halloween festival, a fairly small number of people who were not regular zoo patrons raised a ruckus and complained because…. Cotton is racist! Simply the VERY PRESENCE and EXISTENCE of cotton plants…. is racist! I believe some of these people were wearing denim jeans…. but I rather suspect that they think those are harvested from a magical tree in the Wal Mart forest. Actually, the Confederate Battle Flag is now seen as a country music or Southern Pride thing (in the latter interpretation, a decent number of blacks are seen to fly it). It’s only SJWs that are bitching. Personally I don’t like the flag on aesthetic grounds and it angers me more that they’re trying to deface and defile the monuments to Jefferson Davis, Robert E. Lee, Stonewall Jackson, Nathaniel Bedford Forrest and even George Washington and Thomas Jefferson. Bringing up the ISIS flag and Nazi Flag also brings up an interesting point. The modern Islamist movements are very popular with even Western young men (let alone Middle Eastern ones) because they hate the decadence and weakness of conservatives who refuse to stand up to the Left. The fascist and ultranationalist movements of the 20’s were popular with young men for the same exact reason. We have a similar situation here to the Weimar Republic in America (I call modern America Weimarica) due to the SJWs, LGBTs, and their Jewish enablers/backers. America is as much of a sheer freakshow as the Weimar Republic and the GOP and it’s Christian Right base aren’t helping. The GOP is just the party of Big Business and Israel while the Christian RIght has gotten soft and lost it’s teeth (though it was never as hard as the muscular Christianity of Charles Martel, Fr. Torquemada, Franco or the Crusaders). The Christian Right movement needs to be abandoned for a Hard Right movement with a platform of nationalism, left and right wing populism, nativism, protectionism, and neo-isolationism. On a drive out of town the other day, we saw multiple Confederate flags about outside residences. Driving past someone who had it mounted on their vehicle (I’ve seen a couple of these now), without even thinking about it, I sort of raised my arm in cheer which the guy saw and returned almost immediately. It was honestly like two soldiers on horseback saluting. Kind of surreal. No. I am firmly in Yankee territory. That is why it is such an unusual thing to see. I’ve also seen more Confederate battle flags recently–in Minnesota no less–than I have for years. I seem to remember it’s also, like the Gadsden flag, a symbol of resistance to unjust authority, which probably explains some of it. Now the question I have about the craftsman who made the horses is if he was originally the son of a poor fisherman. So, many inconsistencies in your blog. I thought you’d like to know more details before you spread more misinformation. I expect you to update your blog accordingly. There is a “Calvary Pony” that is paired with the “Confederate Military Horse” (official names), but it does not spot an American flag. In fact, if you were to look at the Calvary Pony, it sports no names or logos, and looks nothing more than a cowboy-esque horse. However, the Confederate Military Horse sports the, well, Confederate flag, as well as the C.S.A. canteen, so there is no mistaking what the horse represents. So people who see the flag can always be reminded that some of us OWNED others as property. How FUN on a family day out! Also, Mr. Willis had no real part in carving most of the horses. He did design many, but left the carving to MANY other gentleman carvers. He designed them by looking at other carousels around the world. The Confederate Military Horse was carved by Lee Roberts and Bob Phillips. Mr. Willis the Master Carver and was head of the carousel project. There were at least 43 people officially involved on the whole project. The Zoo did not request nor commission this carousel. 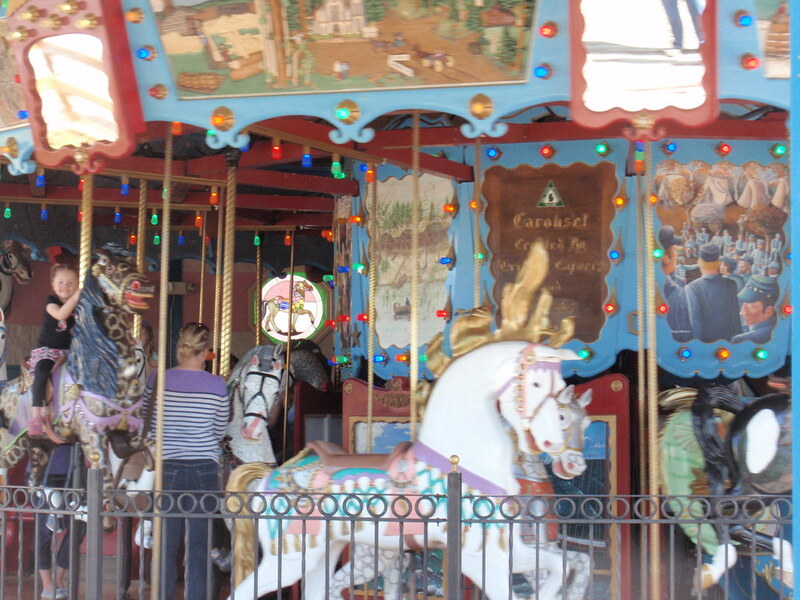 The carvers wanted to create a historical carousel long before they knew where it should reside. The Saginaw City Council suggested the Saginaw Zoo (now currently the Children’s Zoo at Celebration Square) as an ideal location, due to its locking gates and security. There was much debate whether or not the Zoo should be its final resting ground. Finally, the Confederate Military Horse is not, and was not, going to be destroyed. Mr. Willis himself suggested to the Zoo that the Zoo repainted the horse rather than removing it completely to place in a historical museum. Out of respect for the Tri-City Carvers, the Zoo decided to follow his suggestion. However, due to the outcry of the public, the Zoo is now looking into finding a historical museum for it to rest in so that it can further educate the public while not causing discomfort or discrimination in its visitors. The Zoo stresses that it strives to be an accepting and welcoming location for ALL families, and that the Confederate Military Horse is better in a museum. Bob Phillips, one of the carvers, has been contacted and is comfortable with this decision. No one cares about the vocal minorities outrage over the Confederacy. I’m a Unionist, but even I acknowledge that the Confederacy is a part of American history and that Confederate leaders and warriors need to be exalted alongside their Unionist brethren. You wouldn’t get it, Schultz (I assume this is a German name your ancestors stole?). Damn the eyes of the JIDF are everywhere. Why would the Jews be down on the Confederacy? No less than the Sec. of State was Jewish and a good part of his effort was trying to get recognition from the Vatican. Ah, don’t give me that bro. So one Jew was the secretary of State. There as some decent Jews (5% tops) but the vast majority have been nothing but a subversive and destructive force in Western and/or Christian (such as the Slavic lands and the Levant) nations. Take a good look at the vast majority of the modern Jewry. These aren’t Benjamin Judahs, these are Iscariots and Svengalis. Look at the Alger Hiss case, the USS Liberty, the Ethel and Julius Rosenberg case, look at the Frankfurt School, the Weimar Era, Bernie Madoff and Jordan Belfort, and the leaders of the Bolshevist Uprising. You sound ignorant when you blindly state that the Jews are our allies. Even Muslims like Bashar Al-Assad (he’s more of an Alawite, but the Christians of Syria like him plus he is by blood a Syrian not a Jew) are more trustworthy. At the very least, they’ll tell you before they attack you unlike the Jew who’s MO is backstabbing. Plus, once again, I am pro-Union because I support nationalism and also because the Union side was sane. The South wanted to flood the country with even more Africans. and the South was also sickenly philosemitic (like it still is with those Evangelical and Baptist Israel-firsters). The leaders of the Union, especially Grant and Sherman, were against both of those things. Many interwar European nationalists admired the Union.